In 2014, GirlCrew co-founder Elva Carri found herself at a loose end – she wanted to go dancing but all her friends were either too busy or too tired. Rather than resigning herself to a night in, she took to Tinder, created account as a man and explained in her profile that she was a woman looking for platonic company. The response was overwhelming, and within 24 hours she had 100 matches. Carri moved the idea to a Facebook group, where the conversation kept flowing and GirlCrew was born. 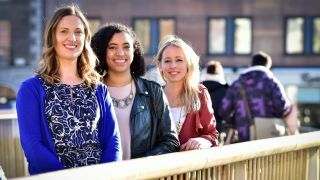 We caught up with Aine Mulloy, one of the site's co-founders, to find out why this is the right time for a women's social network. GirlCrew began as a side project for Carri, Mulloy and third co-founder Pamela Newenham, but they knew they were onto something with the potential to grow, and in 2016 they were able to turn the network into a full-time job. "We now have over 100,000 members in over 50 countries all over the world," Mulloy explained. "The biggest ones are Belgium, Austria, Canada, Ireland and the US." Although its main focus is still meeting and socializing, GirlCrew now runs events on career development, hosts blog posts on diverse subjects, and has become a platform for women to speak openly. "There's definitely a need for that," said Mulloy. "When women speak their minds online, they often get threatened." With that kind of 'toxic' conversation so widespread, how does GirlCrew itself approach hot tempers and antisocial behavior? "There's a core principle of respect in the way members treat each other and talk to each other," Mulloy explained. "If there's a discussion where people disagree, that's OK, but if it's a discussion that develops into something that's divisive then we call it out and stop it. The conversation becomes self-moderating. "You're an adult and you have a personal responsibility. It's a space where people can rely on each other for information and help." Isn't that kind of network something everyone would benefit from? "Men wouldn't really have grasped the idea of why we need it," Mulloy said. "We tried having a men's group, but it just didn't work. There's a mixed group in Dublin, but we're not planning to roll it out more widely." Real-world meetups are still the heard of GirlCrew, and current conversations include a group planning a trip to India at Christmas, another arranging to get-together at a Spanish music festival, and another organising a holiday in Italy. "Lots of people have become such close friends that they've been bridesmaids at each other's weddings," Mulloy said. "One was even a witness at a wedding for a couple who eloped." Another woman posted on the site when her plans fell through while travelling in Japan. Another member happened to be nearby, also without an itinerary, so they met and shared the remainder of their holiday together. Anyone looking for new friends or traveling companions can join GirlCrew online, or through the free app for Android and iOS. If there isn't already a group for your city, you can always start a news post to see who's around. You might be surprised how many like-minded people are nearby.